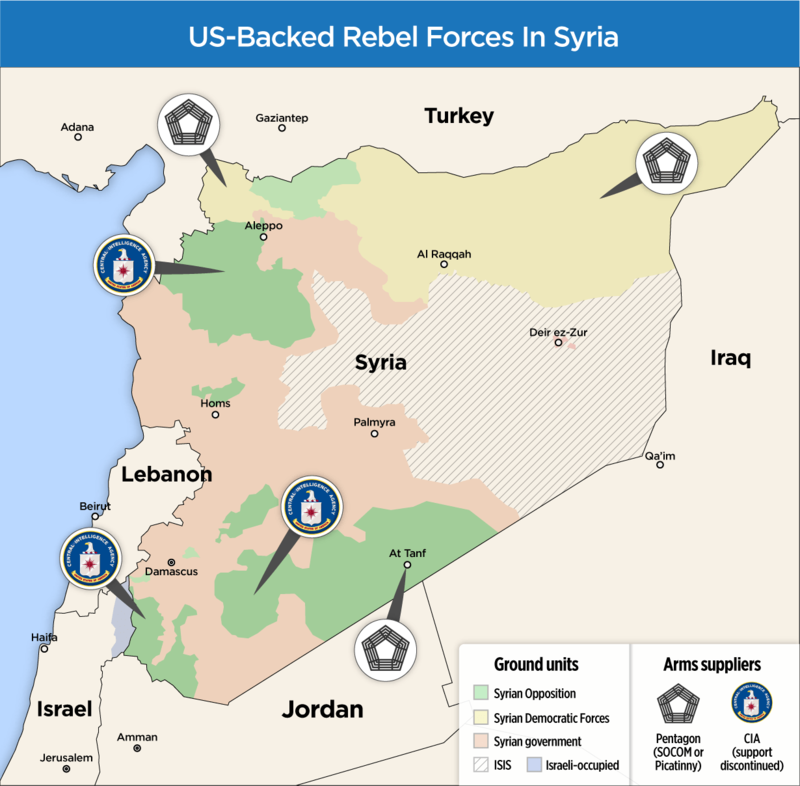 Reporters have pinpointed more than $700 million of spending on weapons and ammunition likely destined for Syrian rebels since September 2015, when the Pentagon’s anti-ISIS train and equip programme shifted strategy. As ISIS swept across Syria in 2014, the Pentagon hastily launched a $500 million train and equip programme that December to build up a new force of Syrian rebels, armed with modern US weapons, in an attempt to counter the threat. But nine months later, the programme had collapsed, with only a handful of recruits having made it onto the battlefield. Special Operations Command, SOCOM, has not previously acknowledged its role in the Syria train and equip programme, but in a written statement to BIRN and OCCRP, the Pentagon confirmed that it had been charged with procuring weapons and ammunition for Syrian rebels. 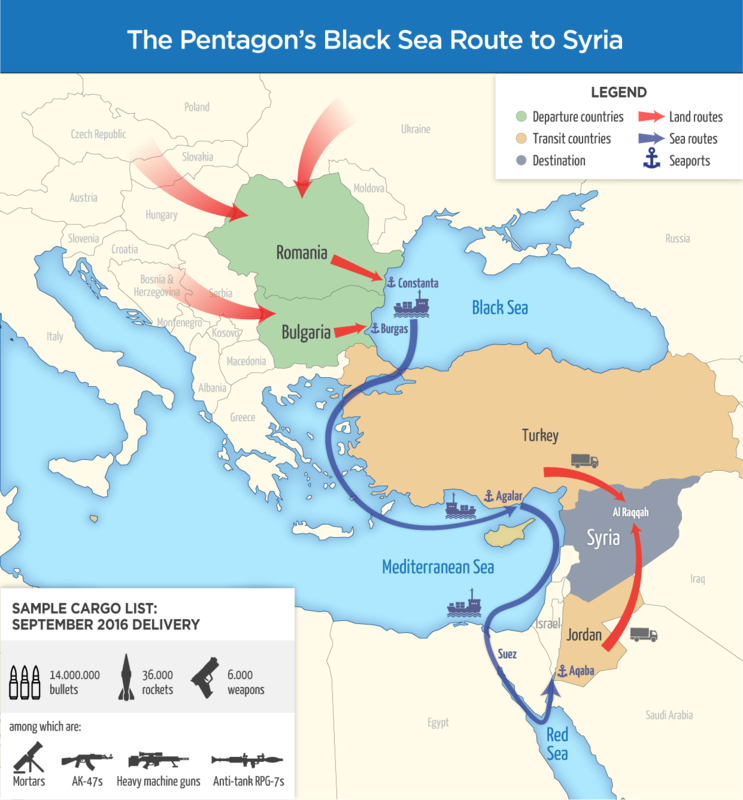 Between December 2015 and September 2016, SOCOM also chartered four cargo ships from Romanian and Bulgarian Black Sea ports, laden with 6,300 tonnes of the purchased munitions to be delivered to military bases in Turkey and Jordan, the main logistics bases for supplying Syrian rebels, according to procurement documents, packing lists and ship tracking data. It also commissioned commercial cargo flights with the Azerbaijan airline Silk Way to air bases in Turkey and Kuwait, other key hubs in the anti-ISIS mission. 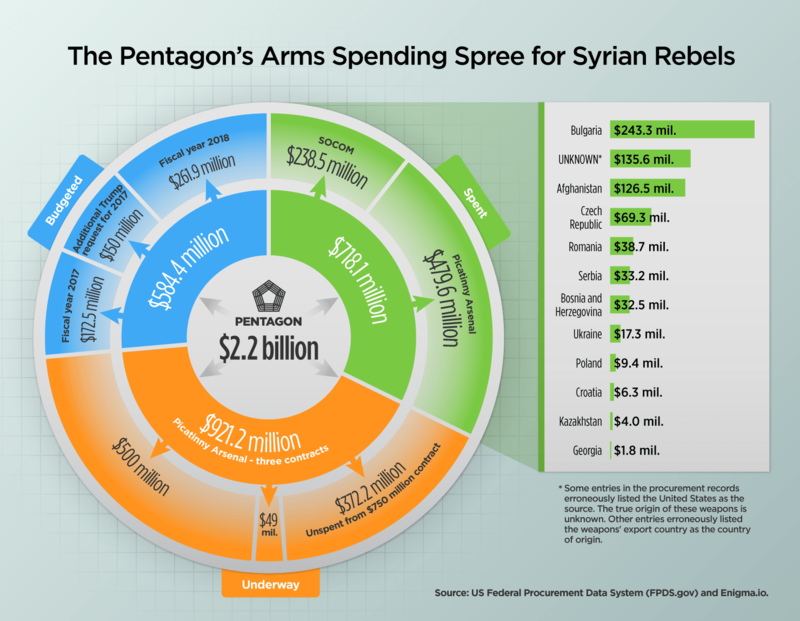 The Pentagon has requested an additional $322.5 million for the financial year ending October 2017 and has asked for $261.9 million for the following 12 months [see infographic], to buy munitions for the Syria train and equip programme. This will include tens of thousands of AK-47s and Rocket Propelled Grenades, RPGs, and hundreds of millions of pieces of ammunition, according to the funding requests made by the Pentagon and the Trump administration. SOCOM had already made a dent in the budget by February, after it issued a $90 million shopping list specifically for Syria, seen by reporters, which includes 10,000 AK-47s, 6,000 rocket launchers, 6,000 heavy and light machine guns and 36 million pieces of ammunition. SOCOM is not, however, the only Pentagon unit that is buying munitions for the Syria train and equip programme. The Picatinny Arsenal, a military base in New Jersey, with the help of its sister facility in Rock Island New Jersey, is also a critical part of the supply-chain. It has bought up to $480 million worth of Soviet-style arms and ammunition for Syrian rebels since the switch in strategy, this investigation can reveal, from Afghanistan, Bulgaria, BIH, Croatia, Romania, the Czech Republic, Ukraine, Georgia, Poland and Serbia. Picatinny boasts of its record supplying large quantities of Eastern Bloc equipment to Iraq and Afghanistan, but it has been far more circumspect about its role in the Syrian conflict, which is politically divisive internationally and involves supplying militia groups rather than state armies. This means that while purchases of non-standard munitions – the US’s euphemism for Soviet-style equipment – were clearly marked for Iraq or Afghanistan, it appears to be Pentagon policy not to label procurement goods destined for Syria. BIRN and OCCRP discovered seven contracts worth $71 million that were signed in September 2016 and cited Syria either by name or the Department of Defense’s internal code – V7 – for the Syria train and equip programme. But these references were quickly deleted from the public record after BIRN and OCCRP asked the Department of Defense and supplier countries about these deliveries in March of this year. Reporters made copies of all documents before they were deleted. The Pentagon has declined to explain the alterations. On top of the $71 million marked for Syria, a further $408 million of Eastern Bloc equipment was made since the strategy switch with no destination mentioned. Seven US procurement document were whitewashed to remove reference to “Syria” after reporters contacted the Pentagon to enquire about whether the exporting countries – Bulgaria, Romania, Serbia, Ukraine and Georgia – had been informed of the destination. Deliveries to Syrian rebels are set to increase in coming years as Picatinny has already earmarked as much as $950 million to be spent on Soviet-style ammunition by 2022 – it spent $1.3billion in the preceding decade – placing further pressure on the supply-line. The newly revealed $2.2 billion pipeline financed by the US, as well as an earlier 1.2 billion euro pipeline financed by Saudi Arabia, Jordan, Turkey and the United Arab Emirates that was previously revealed by BIRN, have meant boom times for arms producers in Central and Eastern Europe. Factories such as the Krusik missile manufacturer in Serbia and the VMZ military plant in Bulgaria have drastically increased production in response. Serbian Prime Minister Aleksandar Vucic promised on July 1 to turn “meadows and forests” into arms factories and almost double Serbia’s arms exports to $750 million by 2020 as he toured Belom, a recently opened bullet factory. While the pipeline has yet to dry up, Pentagon contractors have been forced to scour the world for new sources and have requested permission to provide aging stockpiled material rather than newly produced material, according to documents obtained by reporters. The US had traditionally turned to Romania and Bulgaria for non-standard armaments, but the surge in demand has forced contractors to look to the Czech Republic, BiH, Serbia, and now Russia’s neighbours Ukraine, Georgia, and Kazakhstan, and even Afghanistan, according to US procurement records. The Iraqi end user certificate on the left clearly states the ammunition’s final destination. 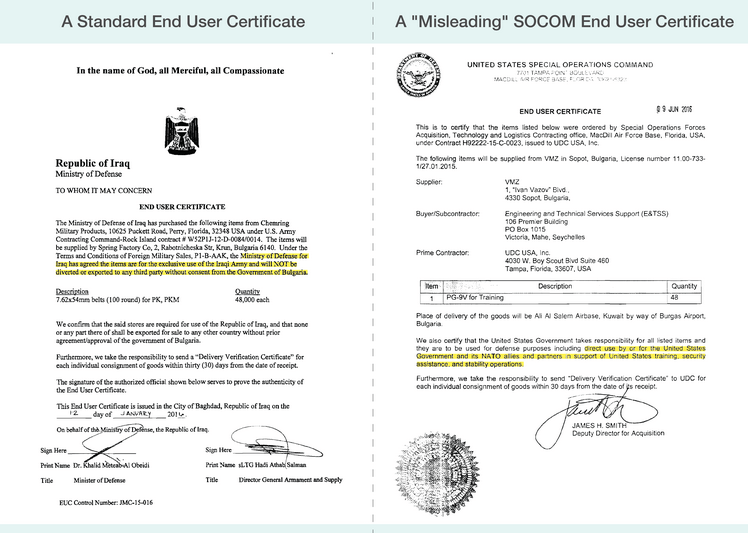 The SOCOM document on the right leaves the end user open and has been described as “misleading” by Amnesty International. As demand continues to grow, the competition between contractors to secure weapons, is becoming increasingly fierce, forcing them to look even further afield, including Pakistan and Vietnam, a source said. The Pentagon contractor, who asked to remain anonymous, said that this had created an “environment where greed is the motivating factor among most … contractors involved”. Scarce supplies have pushed the Pentagon to lower its standards for weapons and ammunition. Previously it had required suppliers to provide equipment of less than five years old but in February it dropped this requirement for some equipment, according to official documents obtained by BIRN and OCCRP. Munitions stored in poor conditions degrade, sometimes becoming unusable or even dangerous. A Pentagon contractor due to train Syrian rebels died in June 2015 when the 30-year-old RPG he was handling exploded at a firing range in Bulgaria. The smooth functioning of the weapons supply-line to Syria depends not only on keeping the final destination of the arms secret but also – say experts who have reviewed the evidence obtained by BIRN and the OCCRP – on supplier countries in Eastern Europe not asking too many questions about why the US is seeking so much Eastern Bloc weaponry. These experts believe that as a result, both sides are likely in breach of their international obligations. A valid end-user certificate guaranteeing the final destination of arms and ammunition is a standard international legal requirement to secure an arms export licence, but an end user certificate issued by SOCOM under the Syria programme and seen by BIRN and OCCRP does not mention the Middle East country. The document is similar in wording to four SOCOM end user certificates leaked online earlier this month, which detail how the weapons or ammunition will be for the “exclusive use of the US Special Operations Command, its NATO allies and partners in support of United States training, security assistance and stability operations”. In a detailed written response, the Pentagon did not dispute designating the US Army as the end user, adding it viewed the transfer of weapons to Syrian rebels as part of its “security assistance” programme, a term it uses in the legal document. Washington has not yet ratified the UN’s Arms Trade Treaty, an international agreement attempting to regulate the transfer of weapons by preventing the diversion of weapons to war zones and improving transparency, and is therefore not legally bound by it. But as a signatory, the US is expected not to undermine the deal, something Wilcken argues that Washington is doing. As a member of the Organization for Security and Cooperation in Europe, OSCE, Washington has, however, signed a series of measures to prevent weapons trafficking — including a binding decision that end-user certificates include the final destination country. European exporter states have ratified the ATT and are also bound by the OSCE’s decisions and the EU’s even stricter rules, known as the Common Position on Arms Exports. The EU rules apply to most prospective members. Under the ATT and EU Common Position, exporters must weigh up the risks that arms and ammunition will be diverted and used to commit war crimes or “undermine peace and security” before issuing a licence. Without knowing the final destination, such an assessment is impossible meaning that exporting states are acting “negligently”, Wilcken said. Authorities in Romania, Bulgaria, the Czech Republic, Serbia, Ukraine and Georgia were presented with US procurement documents showing that weapons they had exported were destined to Syria. Romania, the Czech Republic and Serbia told BIRN and OCCRP that they had granted export licences with the US, not Syria, listed as the final destination. Prague’s Ministry of Foreign Affairs added that it supported the US’s fight against ISIS, but refused to confirm it was aware of the arms’ final destination. Georgia’s Ministry of Defence said an export deal was under negotiation but it had not received an end-user certificate from the Pentagon and no contract had been signed. Ukraine and Bulgaria did not respond to requests for comment. 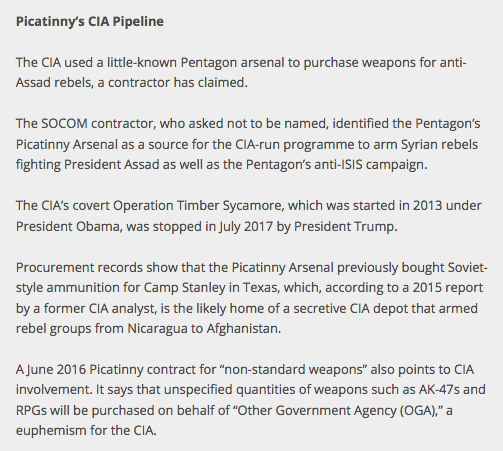 Bosnia and Herzegovina, Croatia, Poland, Kazakhstan and Afghanistan, which have all agreed to exports to SOCOM or Picatinny for an unspecified destination since September 2015, were also asked whether they were aware if these weapons had ended up in Syria. BiH confirmed that it had issued export licenses to SOCOM but not Syria, while Poland and Croatia said it obeyed by all international rules. Kazakhstan and Afghanistan did not respond. German authorities appear to have been less comfortable with how the weapons pipeline was operating. A leaked Pentagon email obtained by BIRN and OCCRP reveals how Berlin had become “very sensitive” to the huge quantities of Eastern Bloc weapons passing through its territory to US bases, apparently forcing a reroute of the supply-line to Syria. Weapons continue to pour into Syria to fight ISIS, and fears are growing about what will happen to the arms and fighters when the jihadists are defeated. Wilcken said that he feared for the future of the Middle East. *Additional reporting from Pavla Holcova, Maria Cheresheva, Roxana Jipa, David Bloss, Roberto Capocelli, Ana Babinets, Aubrey Belford and Frederik Obermaier. This investigation is produced by BIRN as a part of Paper Trail to Better Governance project.